JOHNSTOWN — A team of Fort Plain Junior-Senior High School teachers, which works together to teach an immersive, co-curricular unit on immigration, was honored during the 26th annual School Library System Awards luncheon on May 17, presented by the Hamilton-Fulton-Montgomery Cooperative Educational Services. 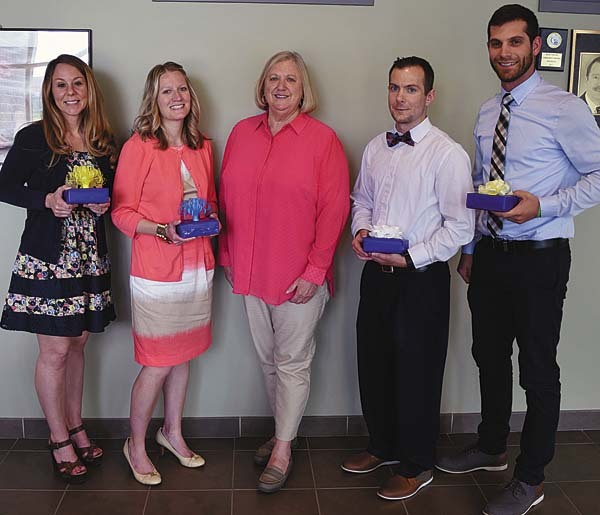 This year’s Collaborative Teacher of the Year Award was presented to reading teacher Kevin Bogus, special education teacher Adam Cutspec, social studies teacher Kolbe Gray and English teacher Tracy Yurkewecz. The teachers collaborate with Fort Plain school library media specialist Mary VanPatten to help eighth-graders learn about immigration patterns using stories of the students’ own ancestors and famous Fort Plain immigrants. The award is given to a teacher, or team of teachers, who exhibit excellence in working with library media specialists to integrate information skills into classroom curriculum and who use library resources and services to enhance student learning. The Fort Plain teachers were nominated for the award by VanPatten, who was included in all phases of planning the project and participated in the student evaluation process as well. The award notes that information literacy was prevalent throughout the interdisciplinary project and the library was a hub for many of the project components. The idea for Fort Plain’s collaborative unit began three years ago during a summer planning session between VanPatten and Gray and blossomed over the years as other eighth-grade teachers wanted to become involved. Besides researching their own ancestors and other immigrants who came to Fort Plain, during the project students also read historical fiction, learn to use the Ancestry.com database, visit a local cemetery with the village historian, make a research visit to the New York State Archives in Albany and produce presentations that are displayed for other students to see. School Library System director Deborah Booth noted that each of the collaborative teachers honored work in different subject areas. “I think that’s absolutely wonderful that you are all working together. That says a lot for Fort Plain,” Booth said. The luncheon was attended by teachers, librarians and administrators from several districts as well as by Dorothy MacVean, representing state Assemblyman Marc Butler, and Jennifer Conkling-Donovan, representing state Sen. James Tedisco. The state representatives each presented Bogus, Cutspec, Gray, Yurkewecz and VanPatten with citations. Also honored Thursday was HFM BOCES library media specialist Edie Willcox, who, after nearly 20 years working at BOCES, will retire at the end of June. A citation from Tedisco’s office was read in Wilcox’s honor. HFM BOCES culinary arts students prepared and served the luncheon to celebrate the honorees in the BOCES Petit Cafe.